The HP 12c is truly remarkable in its longevity as a standard computational device for financial professionals. In an era when electronics such as cell phones (mobile phones), personal computers and the like are rapidly evolving, today's hot, cutting edge device often becomes sorely outdated within a few years. It thus beggars belief not only that a calculator first sold in 1981 should remain in production well into the 21st century, more than 30 years after its introduction, but also that it would continue to be the gold standard for many professionals in the technical fields that represent its target market. 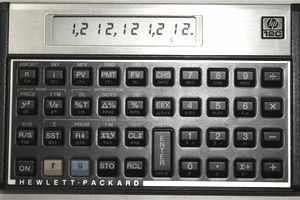 The HP 12c Programmable Financial Calculator has the distinction of leading all Hewlett-Packard products in the number of years produced and the number of units sold. Cumulative sales passed the 15 million unit mark in 2007. Moreover, the famed durability of the HP 12c means that an extraordinarily high percentage of these units remain in use, in some cases 30 or more years after they were first purchased. This is only a partial list of the fields for which the HP 12c is a valuable tool. Moreover, it performs these functions swiftly and efficiently. Additionally, the HP 12c can store custom programs developed by the user. While such applications are usually more easily written and performed on personal computers, the small size and high portability of the HP 12c offers offsetting benefits in this regard. Data entry and the running of computations follows Reverse Polish Notation (RPL), which essentially is a type of machine language or computer code. Despite the arcane sound of the operational convention, it actually is quite easy to learn from the user manual. The key to understanding the version of Reverse Polish Notation as employed by the HP 12c is getting used to entering an operator (such as add, subtract, multiply or divide) after the operand, rather than before. Additionally, after keying in the first operand in a new calculation, the user must press the ENTER key to indicate that a new calculation has begun and that the previous calculation is to be cleared from the display register. At this time the display would read 4. Leaving this result in the display register allows the user to perform additional computations on it. In fact, the use of Reverse Polish Notation makes the HP 12c ideal for performing complex calculations that would be expressed with the extensive use of parentheses. The HP 12c is justly praised for its durability and shock resistance. These were key factors in the original design, and being able to survive long drops onto concrete surfaces was tested exhaustively before initial rollout. Additionally, the HP 12c was designed to be remarkably energy efficient, and actual performance far exceeds the official specifications. The original model was powered by 3 button-sized camera batteries, and the manual projected 6-12 months of normal usage (or 80-180 hours of the continuous program running), depending on whether one installed alkaline or more expensive silver oxide batteries. This reviewer is one of many who has reported that, despite regular daily usage, the calculator ran for over 10 years before needing its first change of batteries. The power source in the current generation of the calculator has changed to a single CR2032 lithium battery, but apparently, the same long battery life is being enjoyed by its owners. The list price fell from $150 at launch in 1981 (about $256 in 2012 dollars) to $69.99 in 2012. This reviewer bought one for $89 in November 1987 (roughly $178 in 2012 dollars). If for no other reason, obtaining and learning to use the HP 12c is highly advisable for this reason alone. Moreover, by permitted its usage, the professional organizations that administer these exams effectively are making a statement about the utility of this calculator for persons in these respective fields. This review is based on an HP 12c that the author purchased in 1987 and continues to use today.